If he gets them up he’ll be an Owls legend. If he fails he’ll have been a Blade all along. 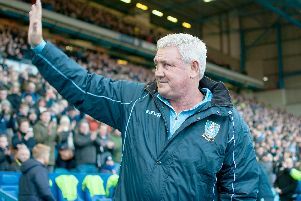 That’s football and that’s what former Sheffield United player and manager Steve Bruce will face as he prepares to take over from Jos Lukuhay at Hillsborough. The vastly experienced 58-year-old ex-Manchester United captain has seen success and failure as player and manager and he takes over a Sheffield Wednesday desperate for someone to lift them to the next level. Good luck to him, the Wednesday giant has been asleep for far too long. Bruce needs backing with money and time though as we all know there’s never enough of either if things start to go wrong. But it’s all going right for United’s record English goalscorer Billy Sharp. He suffered the depths of personal agony when his son Luey died a couple of days after his birth in October 2011. No football records will ever mend that hurt but the 32-year-old has shown dignity throughout his family’s ordeal despite receiving vile provocation from a pathetic few online. On the pitch he has remained a model of industry and application. He’s not bad in front of goal either. Lifelong Blades fan Sharp wishes he could have spent all his career at Bramall Lane but circumstances took him elsewhere to keep his career moving. Now he wants to end his career in the Premier League with Sheffield United. Good luck to him too. Let’s hope he makes a difference on the pitch and on his phone. *Beware the ‘dead cat bounce’. That delightful financial term describes a market or stock that shows recovery after decline then continues it’s downward trajectory. The inference being that even a dead cat will bounce a little when it hits the floor. Likewise the prospects of teams and managers enjoying brief respite from what will eventually be a doomed season.